Kcad is an application suite for Autodesk® AutoCAD® and Microsoft® Windows®, conceived to design kitchens and other catering environments, created in 1994 by Disicad, a company that provided hardware and software solutions based on AutoCAD®. The software was initially commissioned by a famous company in Milan that supplied large kitchens for restaurants and communities, and afterwards was used by other companies of the same sector; currently it is used mainly by a leading group of companies operating internationally. Over the years the program has evolved to adapt to new users' needs and to the changes necessary for each new version of AutoCAD®. The applications' suite is made up of different applications that exchange data, The first application of the full package is an AutoCAD add-in that assists to design kitchens and catering environment by the visual selection of the equipments, helping to draw quickly and easily the project's layout. Inside a drawing, altogether with the usual summary tables, it is possible to display other useful information like technological plugs specifications and their total consumptions. 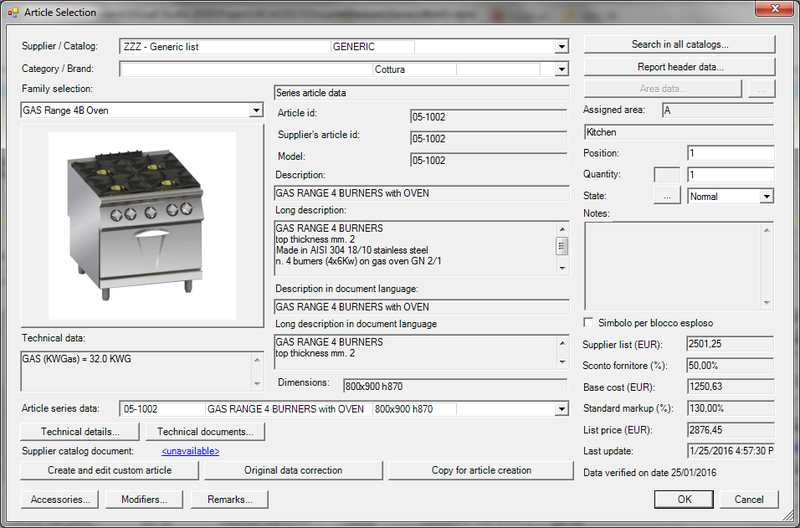 Furthermore, it is possible to modify the data of every sigle equipment in the drawing to create a custom equipment. It is important to notice that the kcad add-in for AutoCAD just add its functionalities using a custom menu, a custom toolbar and a custom ribbon bar, leaving unchanged all the flexibility and the adaptability of AutoCAD, being designed as a facilitation and not an obstacle to drawing: the usual familiarity with AutoCAD allows the user a straight start with Kcad, as soon as the installation is done. A Kcad command is available to switch between the 2D representations of the equipments used for the layout with the corresponding 3D representations, including a simple 3D representation of walls, doors and windows. This makes possible to get quickly a 3D perspective view using the normal tools of AutoCAD, and render realistic images to attach to the offer of the project. Autocad allows to create also short videos to give the illusion of walking inside the environment, like as the project were already built. The second application of the suite is named KcadWin and is a Windows application that allows to manage and modify the data of existing projects exported from AutoCAD, to check them before producing the final offer for the customer, and also to create new projects as a list of equipments without the need of any preliminary drawings, with the aim of compose quickly a quote. This application can be used in workstations without havin AutoCAD installed, and uses the same dialog interfaces used in the AutoCAD environment, the only differences being the features that specifically require AutoCAD. This application allows to make any kind of changes in the list of equipments that represents the project, adding, editing and deleting each equipment and each feature of a selected equipment, just in the same way it is possible to do using the add-in used in AutoCAD. Furthermore, the information displayed by KcadWin allows the user to check in any moment the costs and the profit margin of the overall offer and any signle item. If the offer is accepted by the customer, the drawing can be created or updated quickly using a specialized functionality, that allows to import all the equipments listed in the offer inside an AutoCAD drawing and also to check and resolve all the differences with an existing drawing already created with Kcad. At every project stage, the application can give a quick feedback about prices relative to a set of selected equipments. It is available also a print preview of all the consumptions relative to a set of selected equipments, with the sum for each consumption type. The third component of the suite is an object's library that can be used by the VAB macros in Microsoft Excel® or Microsoft Word®, or by other applications able to use ActiveX components. Along with Kcad, it is supplied a working example of Excel add-in and a template to compile an offer, but it is possible to ask for other custom add-ins and custom templates for Excel and Word. 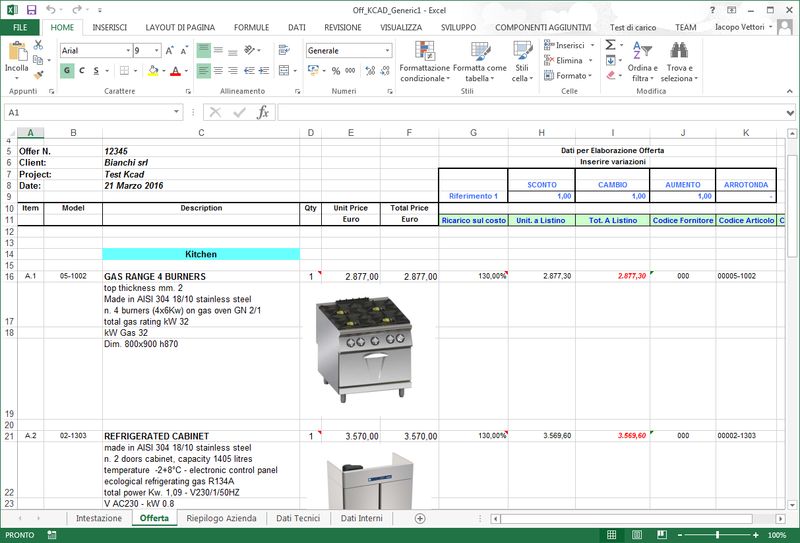 In the sample template, an additional menu in Excel allow to compile automatically the offer, to edit every single item with the same dialog boxes available in KcadWin and in AutoCAD and to save the changes so that it is possible to update backwards also the data in the AutoCAD drawings. All the applications in the suite must be able to access to the equipments'lists that are stored in Microsoft Access® databases. This requires to install a database driver to read and modify all the databases, but it is not necessary to have Access to use the Kcad applications, neither to use its advanced functionalities that allows to edit existing lists and also to create new custom lists. Along with the initial installation of Kcad it is supplied a basic list of generic type, that allows to create rough estimates, without any reference to specific supplier products. 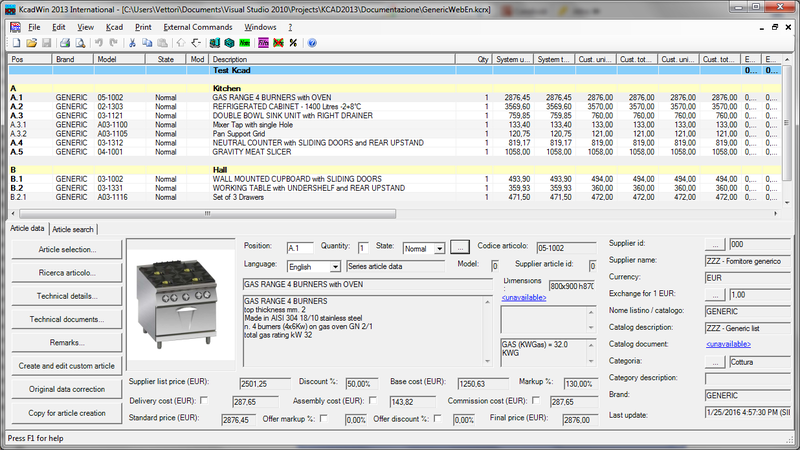 The catalogs and price lists in a format suitable for Kcad can be requested to supplier companies. In this web site there are avialable all the needed functionalities to allow to supplier companies to distribute their catalogs and price lists updated with a personalized management of the discounts. To have a list not available in Kcad format, but having all the required datam it is possible to use the generic list as a format template to create independently the new catalog, gradually adding only items that are actually used. It is also possible to ask for the creation and the publication of a list in KCAD for your own products.